Last edit: 10 years 5 months ago by Alessandro Crespi. This is the first scenario available in the base game. Usually Syracusan wins, so this could be a good playground for new players. Eric S. Raymond wrote some comments about this scenario on his webpage. This first scenario is a fairly straightforward power-vs.-maneuverability confrontation. If the Syracusan general can bring his heavy infantry to bear squarely against the opposing line, he will win. 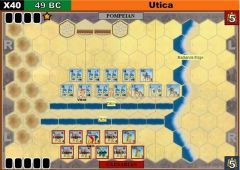 The Carthaginian must maneuver and hope to pick off five Syracusan light units before that happens. I think the advantage is slightly with the Syracusans in this senario. 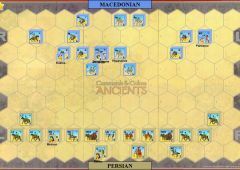 Their missile troops have better range, which tends to prevent the Carthaginian skirmishers from doing much to disrupt the Syracusan heavies. And the only real mobile striking force Carthage has is the chariot and light-cavalry pair on his extreme left; a flank attack against the Syracusan right is thus about the only way Carthage has to secure the initiative. If that fails and the Syracusan makes no large exploitable errors afterward, he's got a lock. 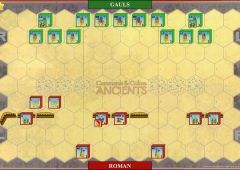 This scenario could be rebalanced by giving the Carthaginians 6command cards rather than 5. 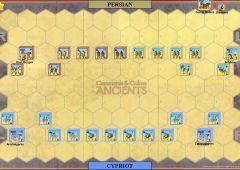 Carthage won this battle through the skilled use of ranged combat. 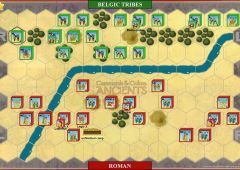 Before the initial contact between the two groups of infantry, the Carthaginian light units peppered the Syracusan line managing to eliminate a heavy unit and severely damage another unit. The Syracusans were only able to get three full strength units in to combat. This should have been enough to crush the weaker Carthaginian army, but unfortunately it was not to be. 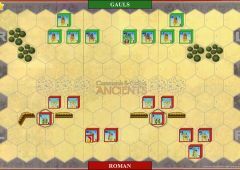 The Carthaginian line held and then began to cut through the enemy ranks. 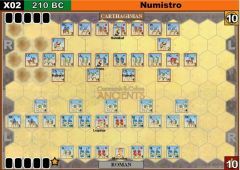 It was a pretty lopsided battle due to the effectiveness of the Carthaginian harassment strategy. The Carthaginian range attack this time was much more ineffective. The Syracusan line was able to advance with no casualties and then proceeded to crush Carthage's center. 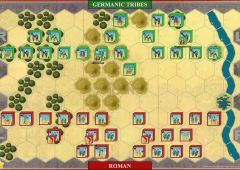 Near the end there was a chance for Carthage to turn the battle the other way, but they were unable to eliminate two heavy units instead damaging them and forcing them to retreat into protection. The MVP has to go to Daphnaeus, who led his heavy unit to smash through the Carthaginian line eliminating a whopping four units throughout the game! To win this one, I think Syracuse has to very aggressively advance their line to get their heavy units into combat. Our group played this three times today, each time with a Syracusan win. 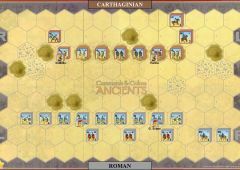 The Carthaginians can use their missle troops, but once the heavies get into battle they will carve up the Carthaginians easily. The left flank of the Carthaginians is particularly weak. In all three games it collapsed. We considered a balance provision that would give the Cathaginians an extra unit (perhaps a light infantry or auxilary infantry) on that flank. Still, it is a fun scenario and we all had a good time. There was no "walkover" 2 x 5-3 wins and 1 5-4 win. I just got the game about one month ago. We had three different players try it out. We all could win as Syracusan, but not Carthage. It did seem to level out our abilities. When I first bought this game I played this scenario alot solitaire, and the Syracusans always won. I finally worked out the best tactic for the Carthaginians is to run their left wing units across to and mostly behind their right wing. You then fight the main battle with your best troops i.e the mediums and heavy supported by Auxillia. The chariots and light cavaly with a leader can be quite devastating if used at the right moment, especially with a mounted charge. Played this on VASSAL. Carthage pushed hard down their right flank with mago and scored an early kill on auxillary infantry due to the noob syracusian general not knowing aux infantry can't evade xD. Mago held out against repeated ranged assaults and 2 leader checks - ignoring retreat flags as a strong, tough leader would. Mago killed the aux infantry and continued his push with his heavy infantry into the left flank of the Syracusians. The Syracusians managed to lower the heavy infantry to 1, who then retreated back to route. Syracuse followed the heavy infantry with a 1 Light calvary in a #yolo charge to try and kill Mago and his heavy infantry, however was outplayed with a 'first strike' card, which ultimately left the LC annihilated by the heavy infantry 5 roll. Confident in his turnaround, Mago survived a calvary charge, transferred to auxillary infantry and continued the charge down the right flank. Syracuse, reeling from losing two units on the left flank, began to march his heavy infantry forward. Carthage responds with a double time to quickly move his auxillary infantry + another troop into the back lines where two bowmen units had previously evaded into. Both bowmen heroically defend and survive (2 and 1). In a display of brilliance, Syracuse then takes advantage of Mago's overextension into the back lines and uses a counterattack card to double time his 4 heavy infantry units. Two units with Daphnaeus cut off mago's retreat, and the other two more push forward into the light infantry centre with Himilco. Mago's unit suffers a catastrophic loss, and goes down fighting heroically with his troops. In the centre, fighting continues fiercly as the remaining two heavy infantry fight the light infantry and aux centre. The aux centre survives with 2 hits, and then responds with a 3 hit battleback. 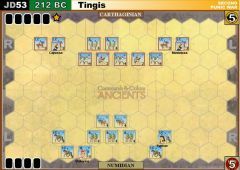 A Spartacus card gets played, then is utilized to move the Carthaginian reserves (back left flank with the chariot) into the centre. Syracuses's centre takes some minor losses but holds with an evasion and another strong defense. 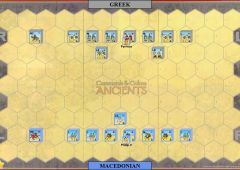 Seeing the reserves moved into action, the Syracusan general quickly moves his reserves (aux LI, LI, MC) from the back right up to the border. 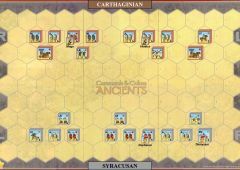 with a score of 3-4, Carthage then attempts to break the Syracusan center with the chariot but isn't able to break it. Another evasion is successful. Finally, the Syracusan general plays another right flank card to send his reserve units with Dionysius behind and flanking the heavy chariot. Surrounded by full-strength troops and a fresh leader, the chariot fell. Played as my first scenario with my 6 year old son. He smasched my center with his H.infantry and collected banners with Cavalry. Well deserved victory and interesting scenario. I will replay it soon in order to get a better understanding on how to win with the underdog.